Ethereal Wall is a block added by the Witching Gadgets mod. When powered by redstone signal, it will make own block and allattached blocks non-solid, so the player can pass through. Any block can be right-clicked on it for the texture of the block clicked with to be used instead of the default one. "Refining the enchantments on arcane stone just a bit more has led to an interesting discovery. Simply applying a redstone signal to this new type of stone will make it non-corporeal, allowing you to pass through it. This also affects any other Etheral Wall connected to the powered block. Furthermore, you can disguise this stone to the appearance of most common blocks. Simply click it with a block in hand it and this one will take its texture. Sneak and click it with an empty hand to remove the disguise. (It will only accept the texture of normally rendered blocks. 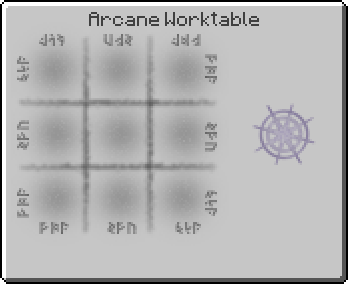 Vanilla transparency works, Thaumcraft's Amber doesn't because it's coloured transparency, directional textures like wooden logs and quartz pillars are not fully supported)"
Air Shard can be substituted with the following items: Earth Shard, Entropy Shard, Fire Shard, Order Shard, Water Shard, Balanced Shard. Ethereal Wall has no known uses in crafting.